You are here: Home / Money / Business / 10 Steps to Plan Your Dream Wedding. (ThyBlackMan.com) A good proverb says: the wedding takes place once in a lifetime, so it must be perfect. The wisdom of generations says: the wedding takes place once in a lifetime, so it must be perfect. To bring it to life, it is desirable first to clarify the question of how to plan a dream wedding. An unforgettable celebration can be made from many small details. It’s essential to be aware of all the moments in order to create a real wedding fairy tale. Of course, it is worth a lot of work, to put the soul into the preparation, as well as imagination, nerves, time and effort. But trust us, it is definitely worth it. Let’s go through the step-by-step guide that will help you to structurize everything in your head, so you will not forget even about the smallest details. Successful events are outlined properly in advance. And this is also concerned about the wedding. Why it is better to start planning a celebration so early? Everything is simple. In order to avoid difficulties you can face because of lack of the time, in case you decide to prepare for the wedding one month or less before the event. Moreover, six months will go fast. Therefore, it is impossible to delay with drafting up a list of primary matters. Decide on the date of the grand event. If you want to go to church ritual, clarify about the day’s when the newlyweds can be crowned. If you are planning to go for the honeymoon trip the day after the wedding, check the availability of the flight, tickets for this date. Just recommendation: the trip and the tickets will cost you cheaper if you book them beforehand. Research the companies that are specialized in the provision of wedding services in your city and compare the prices. So that, you will not waste your precious time just before the wedding. Plan the financial side of the event, expenses, and incomes in advance. Calculate the approximate costs. Talk with your family members and clarify, maybe they will provide some financial support. Create a list of the guest you want to invite for your significant event. By knowing the number of people, you can calculate the estimated expenses for the dinner and drinks. now you know the number of guests, so why not to start choosing the banquet hall for the vent. Compare the price and read the reviews about the restaurants. decide on your hair and makeup and sign up for the specialist beforehand. think over the activities on the second day of the wedding, if it is planned. Planning is always not the easiest process, especially when it is about the most important event in your couple life. 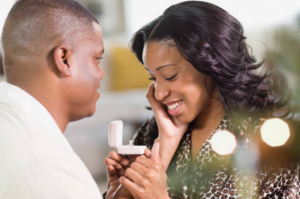 GSDiamonds recommends before the actual date of the wedding – don’t panic. We are sure, that you have prepared fine and all the points from your check-list are appropriately covered. Therefore, just go through everything, try your dress, check the engagement rings, approve the menu and have fun on the bride/bachelor party. Stay positive and get ready for the most significant and beautiful experience of your time.